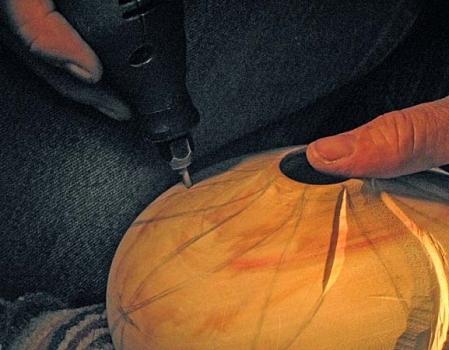 On Saturday July 22nd the Channel Islands Woodturners were privileged to have world renown John Jordan demonstrate his hollow form turning and carving techniques. 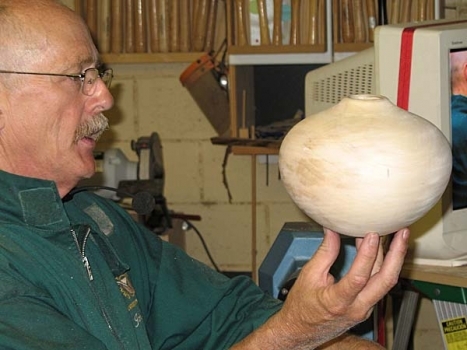 John shared observations about woods, grain, turning for design and utilizing the heart and sap wood, as well as various surface carving and texturing. Some of John’s tools that he used were also available for purchase during the day. Mr. Jordan began the day with basic lathe information and care. 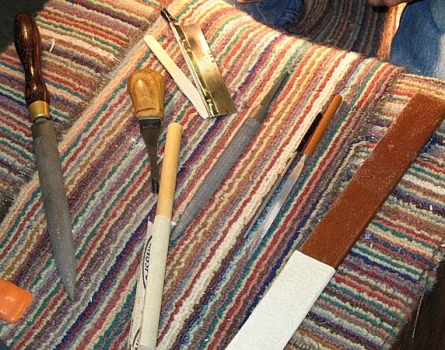 He emphasized cleaning and proper maintenance of the tool rest by using a light file to clear any imperfections and nicks followed by fine sandpaper sprayed with WD-40 to keep tools sliding easily. He also suggested the same treatment for the bed of the lathe so that the tail stock glides easily. Anywhere that metal meets metal should be completely clean of shavings and dust to enhance the performance of the lathe. 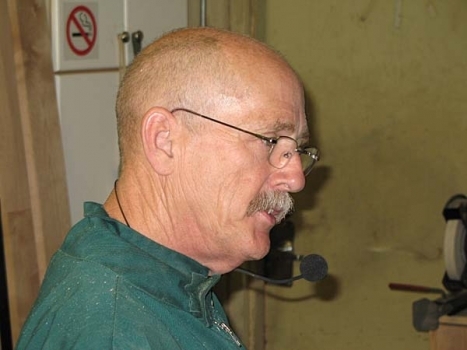 Throughout the demonstration Mr. Jordan returned again and again to the grinding wheel to sharpen tools. Because of this process, cutting was easier and cleaner. Every tool maintained a sharp and dust free surface if at all possible. 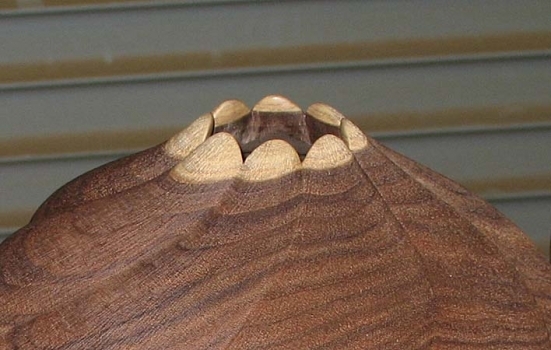 Shavings were cleared away often to prevent their interference with the cut. Greenwood, specifically silver maple, was the wood chosen for the demonstration. Mr. Jordan only turns greenwood (or wet wood). His focus is to turn a piece so that the shrinkage is part of the final design or cleverly hidden in the final shape and carving. He prefers to utilize the natural inclinations of the wood and work with it to his advantage instead of struggling with checks, cracks or warping. John pointed out on other pieces that he had brought for display where the sap wood was preserved as the detailing at the lip of vessels. The pieces had a distinctly organic feel, almost like flower buds ready to bloom. Carving emphasized the fluidity of the form. The demonstration began with a large block of the silver maple placed between centers. John turned a tenon and instead of turning the block cylindrical first, he turned to the final desired shape. A rather large inclusion presented itself near the proposed base of the vessel so John modified the design, shortening the height, attempting to remove it. Unfortunately, it was too large, so it remained. It was emphasized early on in the roughing process that John rarely turns a piece at a speed greater than 900rpm. He suggested that turning faster lends itself to more errors and potential dangers. 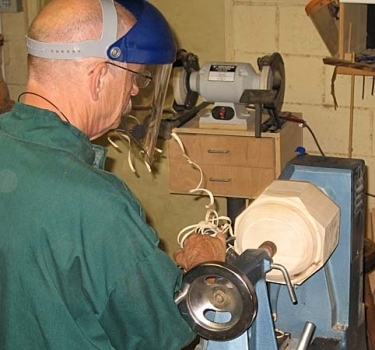 John also began the turning left handed, even though he is right handed, because of his left-handed angle to the lathe he was able to divert shavings away from his body. It was a clever way to keep little shavings from getting under clothing. The initial cuts were basic bevel rubbing cuts. While he was rounding the piece to the general shape he was sure to leave a double tenon, one with a second shoulder. 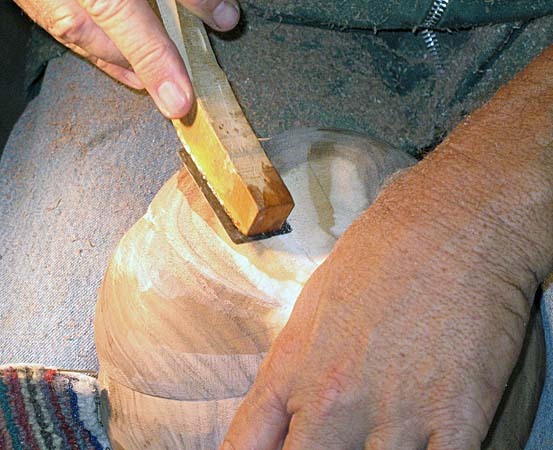 This process was in preparation for a small base in the design, so the bowl appears to be just barely touching the surface of a table. Often a single shoulder will cause a design to have a heavier or larger base which may be undesirable so the turner will have to redesign the shape later. The second shoulder gave more options in finishing the base of the vessel. 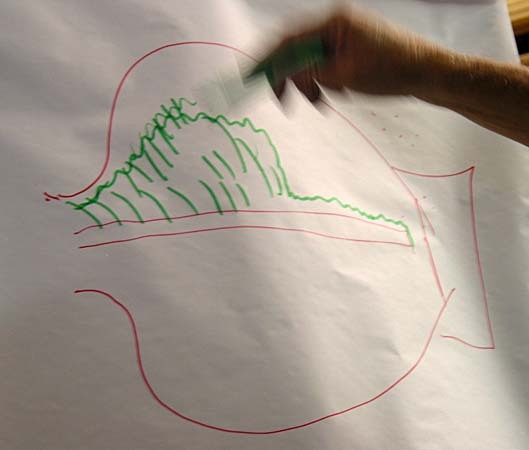 As the design came into being, John constantly watched the profile of the piece. His cuts were from top to center and then from bottom to center always cutting to support the grain of the wood. This prevented tear-out or as John described it, the fuzzies. His final cut was using a gouge that had been touched up with a very fine ceramic slip-stone to bring up a small burr. A sheer cut using this burr produced a surface that would need little sanding for a smooth finish. 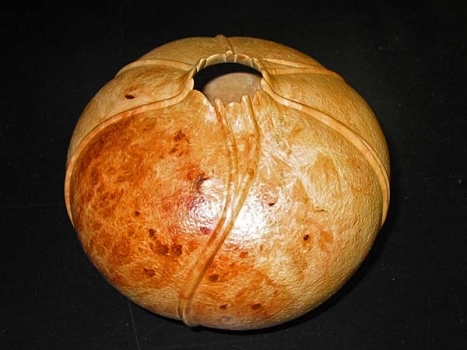 Even so, John would be carving the piece or texturing and stated that any irregularities would only become irregularities that had been covered by texture, they would not be hidden. So, it is ideal to have the best possible surface. The final cut was a pulling cut with the long edge of the gouge. [He also finished with a special tool that he makes with a short handle and a reversible angled straight edge with a slight burr as a shear (scraper). The burr is raised with a very hard and fine ceramic rod. 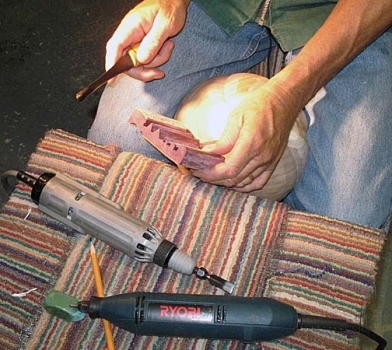 Holding this tool at 45° or more gives the cleanest cut and prevents the tool from flopping onto the tool rest. This could be done with a standard straight ended scraper with a very fine burr but would be more difficult.] John had the lightest touch, producing very fine shavings. If he had pushed the tool or applied too much pressure, there was an increased risk of bouncing on the surface. 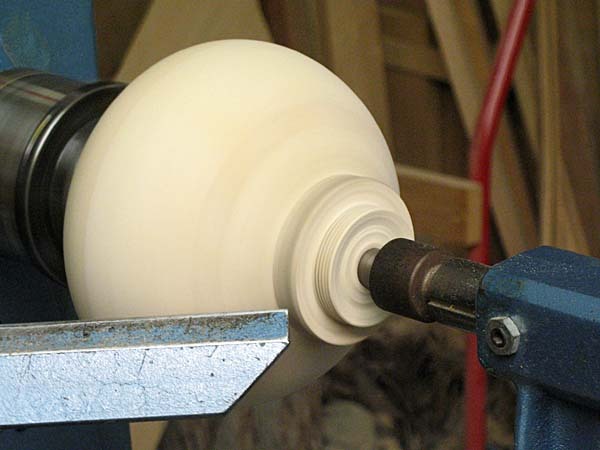 If the lathe is also slowed there is less chance of chatter as well. 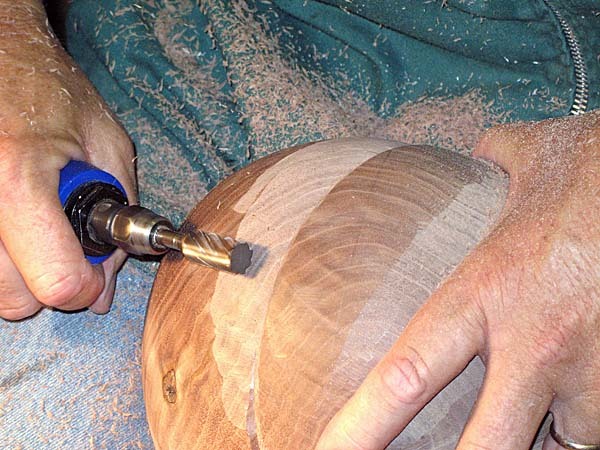 As the outside of the piece had been finished, john approached the hollowing process. Hollowing was methodical. The lip of the vessel was first determined. At present the base was planned for a diameter of approximately 2.5 inches so the opening was nearly that. The design included a slightly pulled up opening (see photos). John then used a long 3/8 drill bit held with vise-grips. He marked the intended depth with a bit of painters tape (very high tech!). This set-up can use an electricians remodeling bit at a cost of 6 to 8 dollars or you can order the bit through a catalogue at a cost of $30.00, your choice! It was emphasized that the bit be cleared often of shavings to prevent bogging down. Also, you would want to be sure the bit does not turn in your hand and cause a friction burn (if you are using a wooden handled variety). At this time, with the guide hole completed, John re-tightened the chuck to be sure that the greenwood had not loosened. A fine coat of paraffin was applied to the tool rest and the back of the tool to allow for an easy glide on the final finishing cut. A straight tool with a 3/16” bit was used to begin the hollowing. 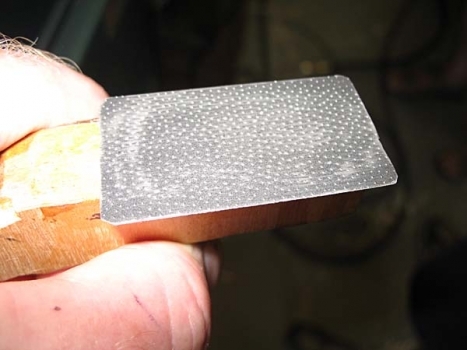 John used a 3/16” square cutter ground to a fingernail shape. Once the bulk of the wood is removed he switches to a curved tool. It was emphasized to keep the cutting edge small to prevent a too large surface from grabbing. The tip was always straight and flat in relation to the handle at or slightly below center. Any angling was done manually. 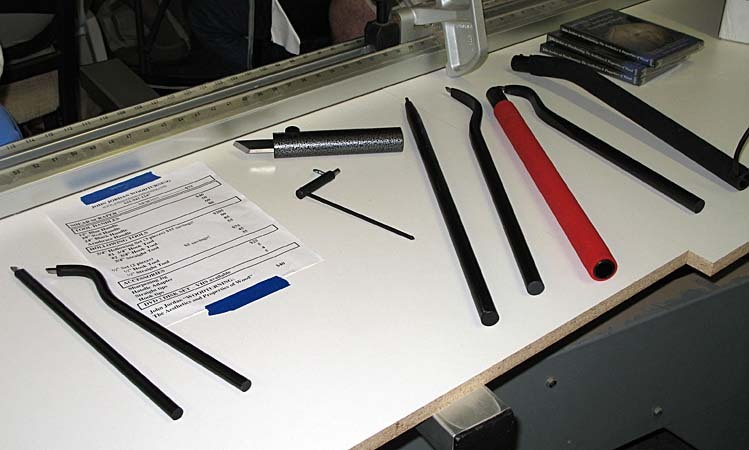 The tip was also kept in line with the handle to provide more support in cutting. At this point John was not as concerned with wall thickness as he was with removing the bulk of the material from inside the vessel. Again, he often stopped to sharpen tools and remove shavings from the piece and the general area he was working on. 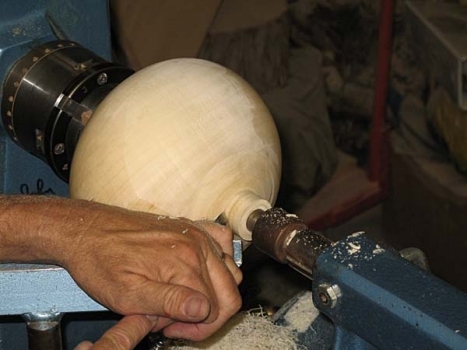 Being careful not to remove the tool while the piece was still turning, John suggested having a switch nearby so that you could safely stop the lathe to clear shavings. The piece was progressively hollowed always removing from the center all the way through. This method prevented the piece from beginning to dry unevenly, provided constant support and made the final cuts smoother. At the time of the final interior cuts, John finished the first two or three inches from the lip and then left a small shoulder. He was able to progressively, using a series of small cuts, remove wood below the shoulder and blend the sides. This allowed him to have a good idea of the wall thickness consistency. 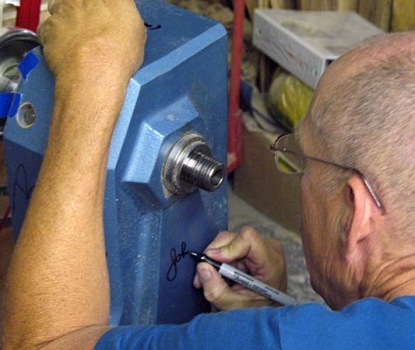 While the demo piece was turned to approximately ¼” wall thickness, most of his pieces are left somewhat thicker (approximately ½”) to allow for the deep carving that he will do after the piece is completely dry. At this point in the demonstration the piece was removed from the lathe. 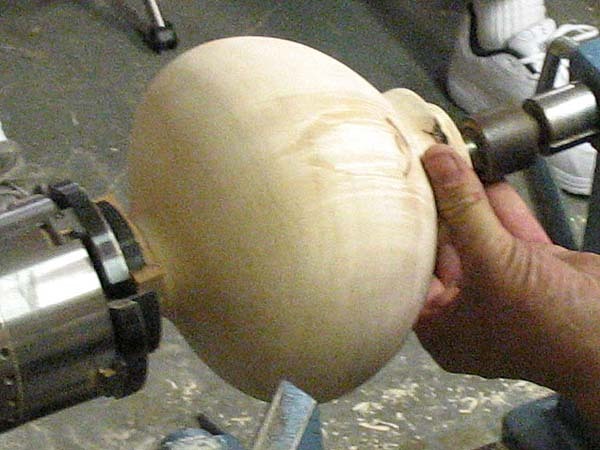 A jam chuck was made to turn the piece and complete the bottom. 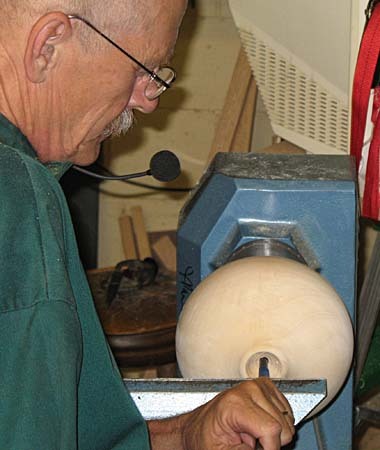 John had the lathe turned very slow (approx. 500-600 rpm to allow the tool to follow the slightly off round shape of the base. This slight oval was due to the rapid drying of the piece. The bottom was turned following the outside curve of the vessel with a very small flat so the piece appeared to just lightly sit on the table. 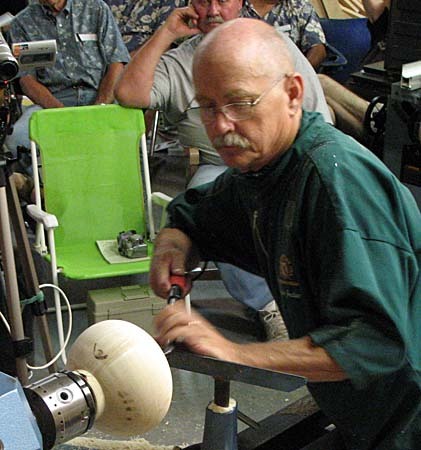 Before beginning a demonstration of carving and texturing techniques, John discussed the nature of shrinkage in wood. He did several drawings showing how a piece of wood would lend itself to the final shape of a vessel. 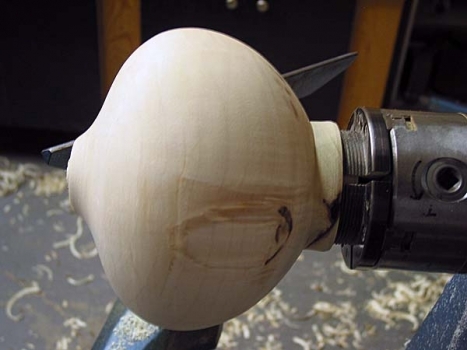 For example, a bowl cut side grain with its bottom at the pith of the wood will dry with a concave opening edge, a bowl with the opening at the pith will have a double peaked edge, and a tall vase turned parallel to the pith (end grain) and off center will develop a final egg shape. Knowing the woods tendency in the drying process will allow turners to make design choices and avoid having to try to correct less-than-pleasing final shapes. 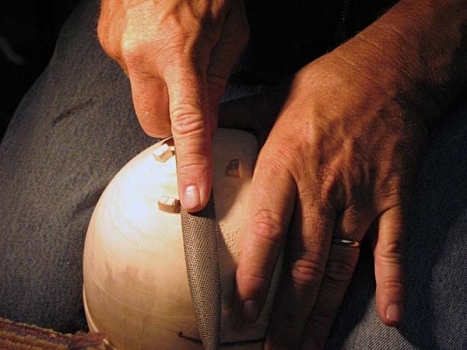 The final portion of the demonstration dealt with the various carving and texturing techniques that Mr. Jordan uses. His first was the layout of a basic grid on a piece to plan the flutes or spirals. At the lip John marked off 8 lines. This could have been precisely measured out but, as John put it, that would not have allowed for that human feel of a piece that he desires. 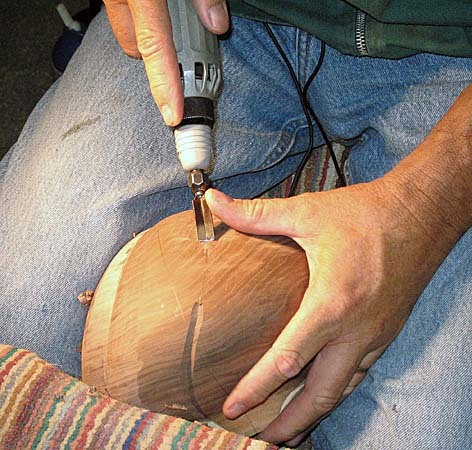 Using an AutoMach reciprocating carver fitted with a V gouge, John followed the spirals that he had drawn on the piece. He them followed with a carbide spiral burr using an air-driven die grinder with rear exhaust to soften the cut sides. This technique gave the resulting closed petals that seemed to spiral up from the base. (Again, see the pictures as words cannot clearly relate the flowing spiral and soft roundness of the sections of the pieces.) John Jordan uses a wide variety of tools to achieve his desired effects (Dremel rotary tools, steel and brass wire hand brushes, wire wheels in held in a Jacobs chuck on the lathe with the piece held by hand, French files and small hand saws). He emphasizes experimentation with a tools and textures to enhance your work. His suggestion is to turn a number of small, quick pieces and practice, practice, practice. This practice not only gives insight to what a tool can produce as a texture but it gives the turner the practice with the tools so that they are comfortable, when we are comfortable with the tools we can concentrate on the creativity that produces amazing objects. In conclusion, the day was 7 hours that could not possibly be covered in 3+ pages. There was so much presented and so many ideas. Special thanks to Russell Babbitt for video taping the demo (if you missed the demo, please check out the video from the Channel Islands Woodturners library), and to Doug Eaton for arranging lunch; Ron Lindsay and David Frank for the still photos that accompany this article; and David Frank for putting it on our website. 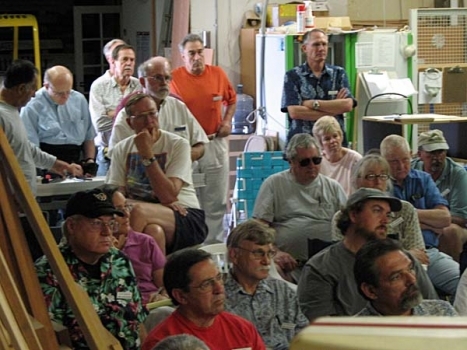 Especially we are thankful to John Jordan for sharing his expertise and skill during this educational event.